"It was a blessing," talk show host Rush Limbaugh said of his good health news. Honolulu, Hawaii (CNN) -- Tests that were performed on Rush Limbaugh after he was admitted to a Hawaii hospital for chest pains "found absolutely nothing wrong," the conservative talk show host said Friday. "It was a blessing," Limbaugh, 58, said at the Queen's Medical Center in Honolulu, where he was admitted Wednesday. Doctors gave Limbaugh an angiogram Thursday that revealed no evidence of arterial or coronary disease, he said. The cause of his pain -- which he called "real" -- has not been determined. He said one possibility is a spasm in an artery. He was discharged from the hospital Friday. Limbaugh said his ordeal started Wednesday afternoon, when he began experiencing pain in his upper left chest "like I've never experienced before." He praised the care of the medical staff and called their work "confidence-inspiring." 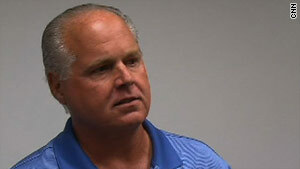 Limbaugh said the experience was a good lesson as he approaches his 59th birthday January 12. "It takes things like this in life to prepare you for the eventuality that you are getting older," he said. "You're not as young as you were and not as invincible as you once thought you were." He urged anyone who experiences heart or chest pain to seek medical help immediately. "Don't mess with it," he said. Limbaugh's radio show is broadcast on more than 600 stations and is heard by more than 13.5 million listeners each week. Last year, he struck a deal with Clear Channel Communications to extend his contract through 2016. The deal is worth more than $400 million.